Ethnic Knitting Discovery: The "model shots"
This is the fifth (and final) post in a series about the development of the visual elements of Donna Druchunas' new book: Ethnic Knitting Discovery: The Netherlands, Denmark, Norway, and The Andes. Today's topic is what we call in shorthand the "model shots" or project drawings, which were drawn by Joyce M. Turley of Dixon Cove Design. All the illustration work that came before the "model shots" prepared the foundation from which we could create them. This included the charts and swatches; schematics and flat drawings; techniques; and even the cover development. In this post I'm going to talk about how we produced these twelve critical illustrations, one for each project, by using one of them as an example. Yesterday, I gave two answers to a question that comes up from time to time: "Why doesn't this book have color photographs of the projects?" If you're wondering that, you may want to see this explanation. There are two important reasons, one that relates to the purpose of the book and one that relates to environmental concerns. So we opted for black-and-white illustrations. The style and accuracy of the images was perhaps even more important than it would have been if we'd been using photographs. In addition, for Ethnic Knitting Discovery, the "model drawings" would set the emotional tone for the whole book. That's a tall order. Fortunately, a few months earlier I happened to meet Joyce at the annual conference of the Publishers Association of the West. 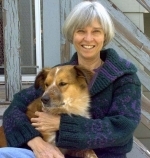 I'd already established that she knows how to knit and crochet, and she does illustration work in a number of styles. She's local, so I contacted her and asked to see her portfolio. We met at a coffee shop, and as it became apparent to me that she might be able to do the work in a way that would meet our needs, and that her schedule could accommodate the book's requirements, we began to talk at some length about the appropriate style for Ethnic Knitting Discovery. Some of the styles she uses would be appropriate for this book and some wouldn't. By the end of that meeting, we'd decided to take the leap and work together on the project. I gave Joyce a handful of nebulous words to guide her thoughts: playful, fun, approachable, cheerful, appealing, energetic. Working by e-mail, we hammered out a contract, going back and forth through three or four drafts as we defined the work to be done, set up the time frame, figured out how much Nomad would pay for Joyce's work, and clarified what rights Nomad would have and which she would retain. A good contract sets the foundation for a complex piece of work: it provides a framework for discussing all the aspects of scope, schedules, and financial expectations. Because Joyce and I had only met once, and briefly, the contract also let us start getting to know each other's working styles. For the small projects and two of the sweatershalf the modelswe had actual knitted objects to use as references for Joyce's drawings. Kris Paige had kindly knitted examples for all the small projects. She checked out a preliminary form of the instructions as she did so; we incorporated a number of her suggestions in the final versions. 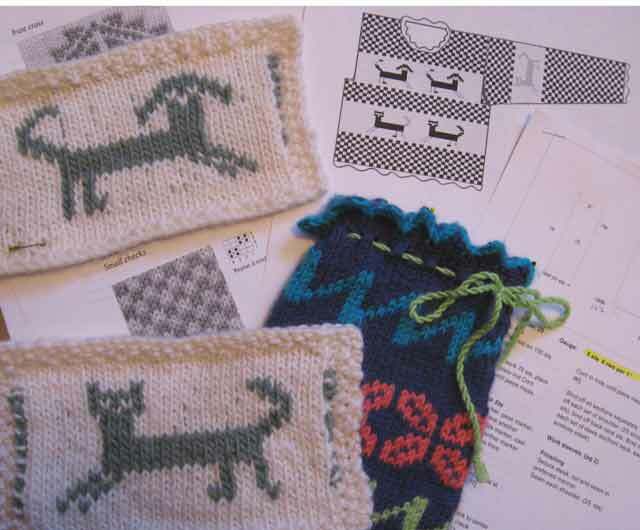 Debbie O'Neill knitted two sweaters that we also showed, in photographs, on the cover. For all the model drawings we depended heavily on the background information I put together for the schematics and flat drawings. I assembled a packet for each drawing. I sent part of it to Joyce electronically (photos and composite sweater worksheets). Part of it she had physically available (swatches and small projects). The small bag in the photo above was a test project (I knitted that one) that helped me show Joyce how the puntas (a technique that's taught in the book) work at the edges of a knitted piece. You'll notice significant differences between Debbie's sweater and the design in the drawing. 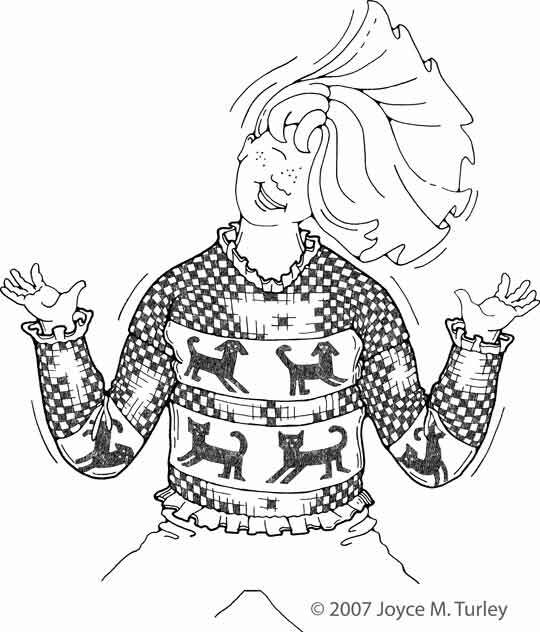 Debbie's sleeves are striped, and she has incorporated some patterns that are in the book but weren't used in the design shown in the flat drawing. Debbie's sweater has a boatneck and the one in the drawing has a crewneck edged with puntas. Debbie's sweater is sized for a toddler and the drawing shows a sweater for an 8-year-old. The two sweaters are also at different gauges. The point of the book is not to help readers replicate a specific design but to develop their own designs, using the elements described or ideas they've gathered from other sources. We did want to make sure that the sweaters in the drawings, including those on the models, could actually be knitted as they were shown and that their proportions were correct in relation to the people's bodies . . . although, of course, readers can choose different amounts of ease, lengths, and other aspects of the sweaters they knit from these templates. Joyce did sketches, working by hand with a pen, and set up a private web page for me to take a look. I gave her feedback and she made modifications. We made major revisions to only one drawing, although we tweaked details on all of them. I knew we would be okay when we were talking about the types of people who would be wearing the garments and Joyce wrote in an e-mail, "I only draw people I would like to have as friends!" That was great for me, because I spent a lot of time in these folks' company as I designed and laid out the book (actually, Joyce had preliminary layouts to show her how big the drawings would be and what other material they'd be juxtaposed with). It turns out I would like to have them all as friends, too. For the final drawings, Joyce used a combination of hand drawing and electronic adjustment in Illustrator. 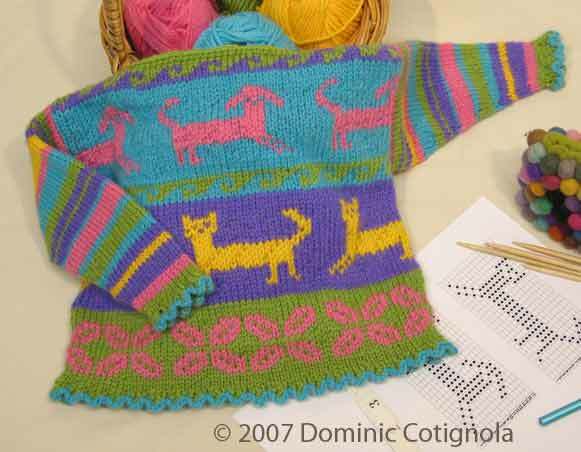 In particular, she used the computer to put textures in the dark areas of the colorwork sweatersa technique that worked beautifully. That certainly looks playful, fun, approachable, cheerful, appealing, and energetic to me. I also know it's an accurate representation of one possibility for the project. To see more of what Joyce came up with for Ethnic Knitting Discovery, check out this page (which is a lot like the preview pages she sent me links for) and the book itself. I've enjoyed writing this group of posts. Now it's time to go work on a book! Thanks so much for this really great series of posts. I've really enjoyed learning about the process and how all these elements come together. I found the Model illustrations really fun but obviously well thought out. I appreciated how drop shoulder seams appeared where drop shoulder seams should and that drawing were done to represent gauge. I thought those little details made a huge difference and showed a lot of care. To the points in your "green" post, it gave an impression of what one could do without locking you into any one variation of the theme.